Vehicles being targeted by criminals in South Africa and seasonal crimes have been on the rise. Data provided in the below article by Business Tech shows that the socio-economic challenges we face have a direct impact on crime levels. “Business risk specialist, Bryte Insurance, has released its latest Crime Tracker for 2018. The tracker is an indicator of long-term crime trends in South Africa as captured by insurance claims from October – December 2017. It measures the annual change, on a quarterly basis, in crime-related claims (due to hijacking, robbery, theft and malicious damage) committed against South African businesses. The latest data points to an increase in total incidents of crime impacting businesses when compared to the same period in 2016. “Unfortunately, persistent socio-economic challenges continue to impact crime levels but what we also noted was a rise in seasonal, opportunistic crime as the year came to a close,” said Cloud Saungweme, chief claims officer at Bryte. “While historically, the perception is that crime spikes during December and January, our data shows notably high levels of crime as early as October which could be indicative of criminals attempting to obtain extra cash for the festive season,” he said. From a business perspective, the motor and property sectors remain among the most affected, while the theft of electronics and other equipment from buildings as well as the robbery of goods in transit is also a prevalent trend, Bryte found. 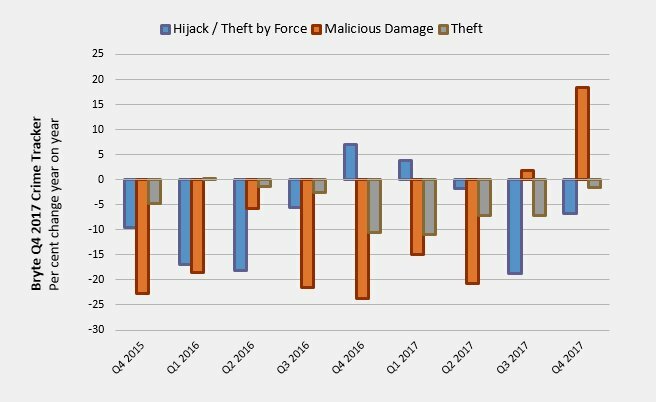 According to the tracker, incidents of theft continued to fall, with a 1.5% contraction noted in Q4 2017 versus 10.5% in Q4 2016. It found that the theft of vehicles, which is the leading contributor to these figures, is often committed by opportunistic thieves such as unemployed individuals rather than syndicates. 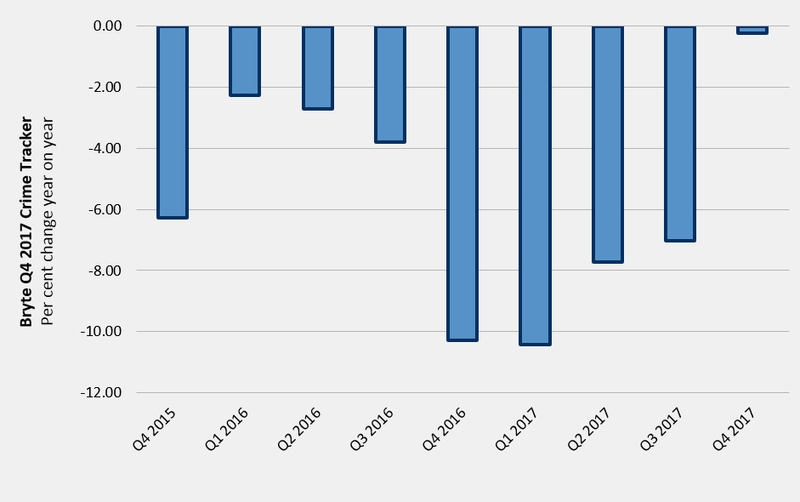 There was a 6.7% contraction recorded in Q4 2017 versus the 7% growth documented in Q4 2016. Significant progress has been noted when it comes to contact crimes. However, vehicle hijackings continue to account for the majority of incidents reported, Saungweme said. “Generally, vehicles that are under five years old are the most sought after and with the market for stolen vehicles in the SADC region rapidly growing, four-wheel drive vehicles are particularly targeted to navigate the poor road infrastructure across the region,” he said. “Toyotas are also prominent on the list of most stolen vehicles as the engines may be used in minibus taxis,” he said. Saungweme also noted that vehicle tracking devices, alarms, telematics and other anti-theft features were truly critical when looking at hijackings across the country. One standout statistic from the latest tracker was the increase in incidents of malicious damage. Bryte noted an increase to 18.4% versus a contraction to 23.7% during the same period in 2016, the largest spike observed over the two-year period reviewed. A significant percentage of the malicious damage incidents stem from damage to property in the act of theft as burglars often wreck security features such as gates, fences and alarm systems to obtain goods and equipment, Bryte found. “The crimes committed are being planned more elaborately with high value incidents primarily being perpetrated by syndicates,” Saungweme said.